SophiaFramework UNIVERSE Application : Scientific Calculator on BREW "psec"
Home > Products > SophiaFramework UNIVERSE > Scientific Calculator on BREW "psec"
Mathematical functions such as trigonometric and exponential functions, as well as floating-point operations are not easy to handle with BREW. December 17, 2004, Sophia Cradle premieres techniques that enable these functions and operations to be used on BREW mobile handsets. The techniques were released on Sophia Cradle's web site, and are open to all developers. 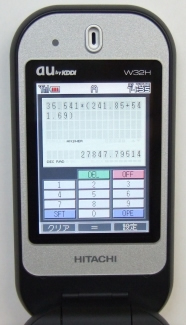 "psec", a highly functional scientific calculator, is the first application to benefit from the breakthroughs. The source code for psec can be downlaoded for free. "What's the value of (π / 6) ?" "What's the of voltage of 2kΩ impedance with 0.5mA of current?" "What's 831563 in hex format ?" To answer these questions, either a scientific calculator or a PC are required. But what if there are no PCs or a scientific calculators around? Wouldn't it be conviniant if your mobile phone could perform these calculations? psec is answer to this problem. psec is a scientific electronic calculator, which allows the input and editing of mathematical formulas on a BREW enabled mobile phone.